When the geese head south, the stars head north: to Canada, for the Toronto Film Festival. Taraji P. Henson, in town for Peep World, demonstrates jet-setter chic. A few hours later, she'd switched to equally effortless classic glam. Jennifer Connelly celebrates What's Wrong With Virginia? in an irreverent take on the tux. Malin Akerman attends The Bang Bang Club premiere in a getup worthy of a reimagined Ring Cycle. 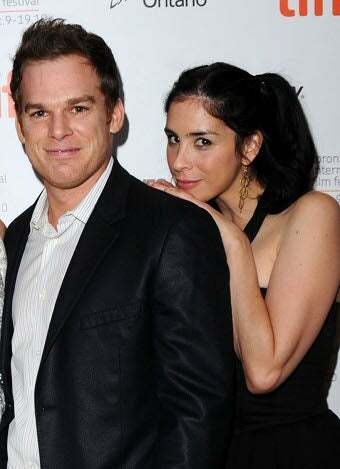 Sarah Silverman, here for Peep World, strikes her "Bedwetter" pose in an aggressive little dress. I like that in the last few months, Judy Greer has gone kind of Valley of the Dolls bombshell! Ryan Philippe does his pouty male sexyface, which is kind of a failed smoulder. The blond smoulder is hard to pull off, but as Ryan Gosling demonstrates, it can be done!